A woman jumped out of her moving vehicle while driving in Rowland Heights and let it roll into opposing traffic for reasons unknown. 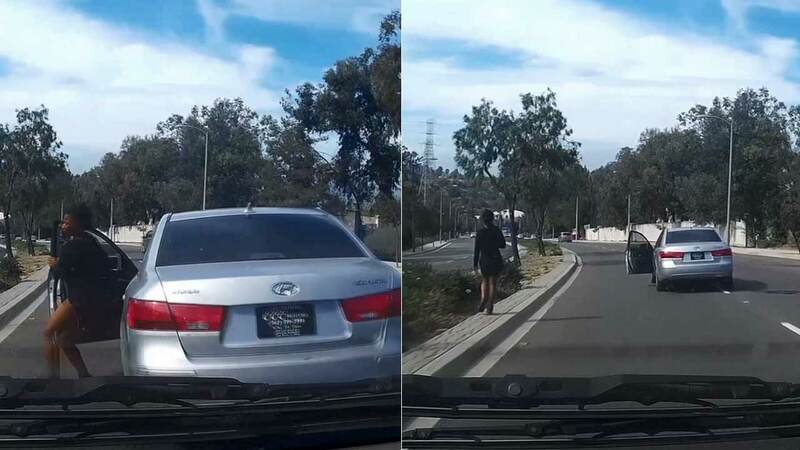 ROWLAND HEIGHTS, Calif. -- A San Bernardino woman slammed on her brakes and then stepped out of her car while it was still moving in a bizarre crash caught on a dashboard camera in Rowland Heights earlier this month. The crash occurred on Harbor Boulevard near Vantage Point at about 3:45 p.m. on Sept. 1. In the video posted to YouTube, the woman behind the wheel of the 2010 Hyundai Sonata exits the car and allows it to cross the center divider and crash right into oncoming traffic. Cars can be seen veering to get out of the way. The woman's vehicle finally stopped after hitting two SUVs. The driver of the Hyundai was identified as 22-year-old Jasmine Lacey. She was taken to a hospital for "a non injury-related reason," according to the San Gabriel Valley Tribune. Lacey was never charged with a crime. The drivers of the two SUVs suffered minor injuries.